Google Web Designer is an official program for Windows from Google for creating interactive HTML5 ads and other HTML5 content. 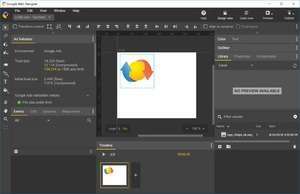 It offers a GUI with common design tools, such as a Text tool that integrates with Google Web Fonts, a Shapes tool, a Pen tool, and 3D tools. The advertising feature set is more complete with components to add Google Maps, YouTube videos and more, as well as automatically including the tracking code events for DoubleClick and AdMob. For security reasons, you should also check out the Google Web Designer download at LO4D.com which includes virus and malware tests. Additional screenshots of this application download may be available, too.